Posted by Kassouni Law at July 24, 2017 & filed under Property Rights, Property Rights Attorneys, Supreme Court Ruling. There are few constitutional rights more established than the right to own private property. Historically, there have been few Supreme Court justices that property law attorneys can rely on to consistently protect that right more than Justice Clarence Thomas. Yet, in the past six months Justice Thomas has released two opinions that should make property rights attorneys scratch their heads and wonder if the esteemed Justice is still in their camp. In Nelson v. Colorado, Justice Thomas was the lone dissent from an opinion striking down a Colorado law that required criminal defendants who had been acquitted to prove actual innocence before the state was required to return their property that it had taken as punishment for their alleged crimes. The Supreme Court rightly held that such laws deprived acquitted defendants of their property without due process. As the Court explained, the state may not take property on the basis of a criminal conviction, unless you have actually been convicted of that crime. No one may be denied their property because they cannot prove actual innocence. Yet, Justice Thomas argued that acquitted defendants have no property right in the return of property taken as punishment for conviction of a crime that is later overturned. According to Thomas, property rights do not exist beyond those defined by the State. Accordingly, because the state had not created a right for acquitted defendants to have their property returned, no such right exists. This is a dramatic departure from Thomas’s previous decisions as well as his judicial orthodoxy which has favored the defense of private citizens’ property rights. Channeling John Locke and the Founding Fathers, property law attorneys and Justice Thomas, generally claim that property rights precede government and form the basis of its existence. This is why Courts have the authority to overturn laws that restrict property rights—government has no authority to destroy rights that it did not create. For Thomas to now claim that states have the right to redefine property rights how they see fit, is a rejection of the very concept of civil rights litigation. Thomas followed this strange dissent with another in Murr v. Wisconsin. In that opinion, Thomas went out of his way to question whether the concept of a “regulatory taking” is possible under an originalist interpretation of the Fifth Amendment. This question is shocking for a few reasons. First, the regulatory takings doctrine holds that when the government passes regulations which make it impossible to use a piece of private property in any meaningful way, the court will treat that regulation as a seizure of the property and require that the government pay the owner “just compensation” for the property similar to what is required when the government takes title to the property outright. 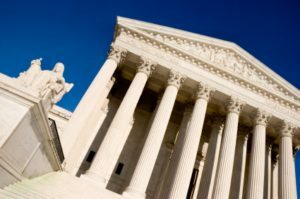 The doctrine has been well established in the Supreme Court since at least the early 20th century and is often relied on by property rights attorneys to fight arbitrary government regulations. It is strange that Thomas, a Justice who can staunchly be relied upon to favor property rights, would question this important doctrine. Second, he was not required to raise the question in his opinion, because neither party questioned or addressed this in briefing. It is strange that he would voluntarily question a sacred dogma of Fifth Amendment regulatory takings when not required to do so. Finally, it is strange that he would raise the question openly when the answer is so readily available. Famed Jurist William Blackstone had already articulated the basis of the regulatory takings doctrine long before the Constitution was ratified—namely, that to prohibit the use of property is to eliminate its ownership. Similar views on property were expressed by James Madison and various other Founders. Property law attorneys have access to this material as do Justice Thomas and his clerks. Given these anomalies, one is left to question whether Thomas has reformulated his property rights beliefs. One hopes the answer is no. A small private firm, Kassouni Law endeavors to protect the Constitutional property rights of U.S. Citizens through advocacy and litigation. Property rights attorney Tim Kassouni can be reached at 877-770-7379.